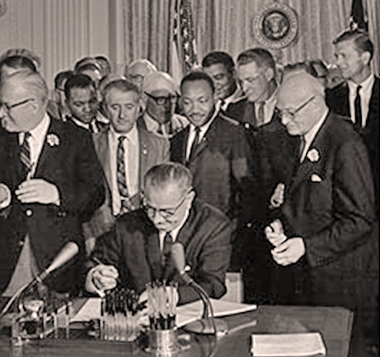 From the New York Times on August 28, 2005, "'When Affirmative Action Was White': Uncivil Rights," by Nick Kotz -- After years of battling racial discrimination and braving state-sanctioned violence -- with hundreds of Southern black churches set fire to and scores of citizens beaten or murdered for daring to challenge American apartheid -- the civil rights movement achieved a climactic victory when President Lyndon Baines Johnson signed the Voting Rights Act on Aug. 6, 1965. It was the outcome of ''a shining moment in the conscience of man,'' declared the Rev. Martin Luther King Jr. In less than two years, the nation did more to advance equal rights for minorities than at any time since Abraham Lincoln signed the Emancipation Proclamation. Benefiting from that ''shining moment'' in the 1960's, a black middle class has prospered and grown rapidly. Yet millions of African-Americans remain mired in poverty in a nation bitterly divided over whether special help to minorities should continue. Affirmative action programs have long been under siege, vigorously attacked in Congress and the federal courts and criticized for ''discriminating'' against the white majority. With conservatives dominating the federal government, civil rights groups and other liberal organizations have waged a mostly defensive battle to protect the gains of the 1960's. Fresh ideas and effective leadership to advance the American ideals of equality and social justice have been in short supply. Ira Katznelson, the Ruggles professor of political science and history at Columbia University, enters this fray with a provocative new book, ''When Affirmative Action Was White,'' which seeks to provide a broader historical justification for continuing affirmative action programs. Katznelson's principal focus is on the monumental social programs of Franklin Roosevelt's New Deal and Harry Truman's Fair Deal in the 1930's and 1940's. He contends that those programs not only discriminated against blacks, but actually contributed to widening the gap between white and black Americans -- judged in terms of educational achievement, quality of jobs and housing, and attainment of higher income. Arguing for the necessity of affirmative action today, Katznelson contends that policy makers and the judiciary previously failed to consider just how unfairly blacks had been treated by the federal government in the 30 years before the civil rights revolution of the 1960's. The Institute for Research in African-American Studies held a symposium to discuss Dr. Ira Katznelson's book When Affirmative Action Was White: An Untold History of Racial Inequality in Twentieth Century America. Click here to watch the panel discussion on C-Span2.